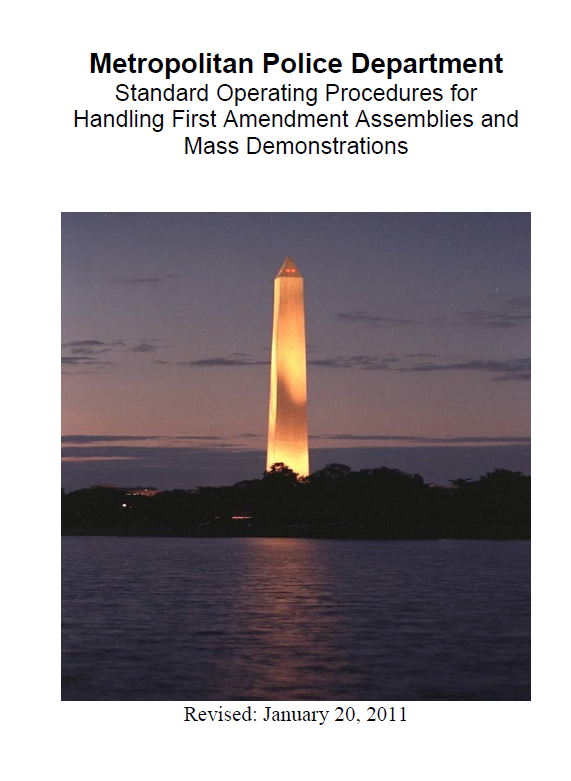 The Standard Operating Procedures (SOP) outlined in this manual are to ensure that this department is prepared to respond effectively and efficiently in accordance with applicable law and District of Columbia policy to any unlawful conduct occurring in the context of First Amendment assemblies. These SOP’s incorporate revisions to the manner in which the Metropolitan Police Department responds to demonstrations and other assemblies on District of Columbia public space that the District has implemented in resolving litigation. This manual also reflects measures mandated by the First Amendment Rights and Police Standards Act of 2004. This handbook sets forth general policy and shall serve as standard operating procedures for all members in carrying out the mission of the Metropolitan Police Department in dealing with all demonstrations, rallies, marches, picket lines, or other similar gatherings conducted for the purpose of persons expressing their political, social, or religious views. This policy is intended to exceed constitutional requirements and satisfy the heightened requirements of local statutory law and best practices. The manual also is designed around the concept of operational flexibility within the requirements of the National Incident Management System. It is impossible to devise specific standard procedures for handling all possible situations, for each has its own characteristics and problems. The overall police philosophy must be one of moderation, flexibility and controlled response. Since each situation is unique, both commanders and supervisory officials must plan to respond according to the nature and size of the crowd. The tactical procedures established within this manual are a guide, and not a substitute for the exercise of sound judgment and proper command and supervision within the context of general departmental policy. It is imperative that members of the force understand the role of the Metropolitan Police Department during mass demonstrations and major disturbances in our city and the manner by which the department prepares itself to fulfill this role. It is to this end that this handbook is dedicated. Unplanned civil disturbances may arise from a number of causes such as political grievances, economic conflicts, community unrest, or in response to police action taking place in neighborhoods, or in the midst of a crowded street, park or public place. Civil disturbance participants come from all walks of life and cover the entire political spectrum. Whenever an unplanned First Amendment assembly arises, the first officer on the scene will serve as the initial incident commander. That member will be responsible for conducting an assessment of the scene, notifying the CIC and the element Watch Commander of the situation and requesting assistance from the Special Operations Division. 1. Gathers to air grievances on issues, and transfers its anger from the issues to the people dealing with the issues. 2. Swells uncontrollably as curious bystanders and sympathetic onlookers join forces with the activists or protestors. 3. Is incited to irrational action by skillful agitators. In civil disturbances, crowds employ any number of tactics to achieve their goals. Their tactics may be unplanned or planned, non-violent or violent confrontations. As indicated, the situations that could evolve into a violent civil disturbance are numerous and varied. Often there will be little or no warning before the onset of violence or property damage. In a few instances, it may be possible to predict a level of civil disorder by the nature of a pre-planned event. However, each civil disturbance situation is unique and commanders and supervisory officials must, therefore, plan and respond according to the nature and size of the disturbance. The policies and procedures presented in this SOP are based upon the concept of operational flexibility, and it is expected that officials will exercise sound judgment and proper command and supervisory responsibility in the control of a civil disturbance.